Visio® is known for its easy and intuitive use with an appealing user interface. Regarding license costs the tool competes very attractively compared to professional modelling tools in the market. Why not use this widespread tool for professional process mapping or modeling of enterprise and business architecture? It is the BPM-X rules engine and database that enriches native Visio® to become a serious alternative to so long market leaders in the field of EA and BPM. Apart from consistent diagrams another missing part is a valid model and object architecture. Visio out-of-the shelf is more a drawing tool dealing with shapes. Though Visio composes distinct objects with a visual notation to a diagram it is far from being a full-blown modeling tool. As another significant add-on BPM-X comes with the ability to store all object data in a central database. Being well structured it is called a repository or enterprise inventory. All object definitions, visually represented as shapes in Visio are stored in the repository with their meta-data. Properties of different data-types and meanings may be defined as meta-data as needed. The repository can be analyzed and retrieved by all object types and data in the structured storage. To make it available in the cloud a web service application server connects the Visio front-end tool with the backend repository storage. The 3-tier application structure consists of Visio as front-end tier, a web services application server as middle-tier and an SQL database as repository backend-tier. The database is well protected and can be exploited with standard web based technology. There is another feature to enhance the basic Visio functionality. The re-use of an object definition in multiple so-called object occurrences allows impact analysis of a model, e.g. where a specific application is used to find out what happens to a business procedure or process if the application fails, which organizational units are impacted by failures and many more. When modeling the contributor of a model documentation may re-use existing objects by a library concept and can check where the object occurrence is used in other diagrams. 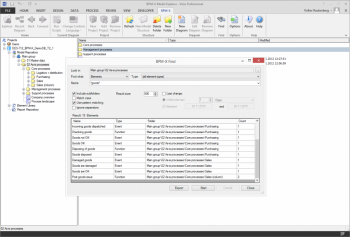 The rules engine add-on together with the concept of object definitions and occurrences stored in a web based central repository adds significant functionality to Microsoft Visio® featuring it to be used as a professional modeling tool. The combination of its ease of use, low costs and consistent model data and diagrams is an attractive new package in the EA and BPM market. The new Visio 2016 has arrived! Pareto principle: Why to move from ARIS 7.x, 9.x or 10.x to Microsoft Visio? Do you still map business processes? Or are you already modeling? To POC or not to POC? – That is the question. 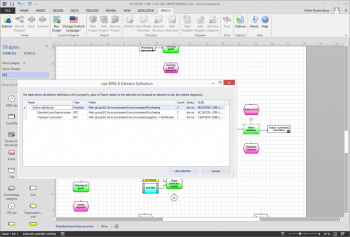 What offers BPM-X for model data and diagram graphics translation? Syndication versus federation – what is the better choice to google your enterprise data? Microsoft SharePoint – A synonym for enterprise BPM? “Less is more” or: What do you really need for professional business process mapping? Process mapping and process modeling, two sides of the same coin? © 2019 TransWare AG is a registered trademark.